Lightweight yet strong, corrugated plastic trays are built to last. Like-sizes nest together to save space and cut-out handles on ends make them easy to carry. These popular trays are the standard for mail handling and package routing in today's mail center, mailroom, office and warehouse. Trays ship flat. 100% Recyclable. Add these trays to a tray cart, click on - Tray Carts. • Six Colors to choose from. • Handle cut-outs in each end. • Nest together for storage. • Trays ship flat - easy fold-up design - fold-up and snap in place. 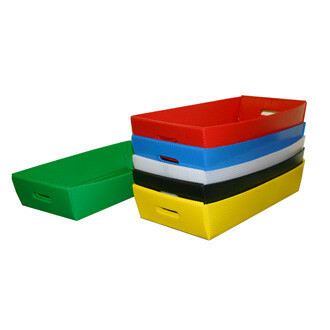 Overall dimensions of trays can vary by 1/4"
Color: White, Yellow, Red, Blue, Green, Black, please specify when ordering. Other colors and stenciling available in large quantities ... call for price quote.